A pet’s nervous system is composed of billions of neurons that form a complex network of pathways within the brain, spinal cord, and peripheral nerves. Disease in any one of these 3 circuits (encephalopathy, myelopathy, and neuropathy, respectively) can cause a pet to experience a lack of sensation and/or motor ability. It’s important to contact your veterinarian immediately should you notice your pet exhibiting any of the following signs that may indicate a neurologic disorder, since the extent of recovery is dependent upon the proper diagnosis as soon as possible and treatment protocol. We recently treated Edison this past summer. 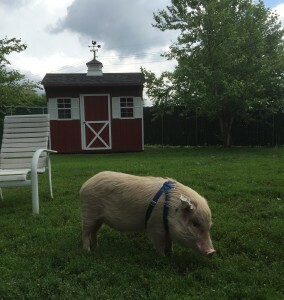 Edison, the famous Pot Bellied Pig who lives at Triple C Ranch in Edison, New Jersey, knows Belle Mead Animal Hospital very well. In June, 2015, Robert Spiegel, executive director of Edison Wetlands Association/Triple C Ranch, called to let us know he was bringing Edison to us because he was experiencing sudden severe weakness in all 4 limbs. He was lateral and unable to get up, stand, or walk when we saw him on presentation. Although he was still mentally aware and responsive, he was extremely weak and not willing to eat or drink anything. We know Edison is a good boy normally, but he was weak and scared. We immediately started Edison on IV fluids with electrolytes in an ear vein and began supportive treatment that consisted of antibiotics, pain medications, propping him on pillows, turning him every few hours, carrying him outside, and trying to help him stand for short periods. On the second day, he was only a bit stronger and able to stand for a few seconds on his own. He was still very weak and neurological looking in all 4 limbs. This is a scary situation not only for the patient, the owner, but also the doctor and all the support staff who so dearly want our patients to be and feel normal again. By the following day, he was definitely feeling a little better but still not wanting to eat or drink on his own. No matter who you are or what treatments you are getting, it’s simple – if you don’t start eating or drinking, then you can’t fully recover. We continued supportive care with Edison and called in his owner, Robert Spiegel, to come for a visit. Edison perked up a bit for him by sitting up slightly, and Bob started spoon feeding Edison. Eureka!!! Edison took his first spoon of mashed up pig pellets in 3-4 days!! Pigs sometimes can be difficult to examine, especially their underbelly and the insides of their legs because they get scared, tense up and scream really, really loud. However, we were able to examine Edison in these areas he generally didn’t want us near. 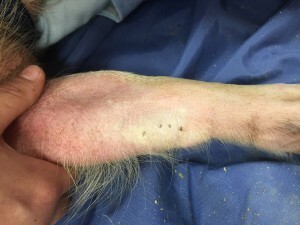 Pigs have scent glands on their legs that sometimes form blackheads and need to be cleaned out, somewhat like a pimple, although these have nothing to do with neurologic disorders. Sometimes clogged scent glands can easily be mistaken for bite wounds from spiders, for instance, or remnant tick heads, as they have a similar appearance. We were thankful Edison was up-to-date on his Rabies shots, and we continued to help him the best we could. We took into consideration all possible reasons for his sudden neurologic generalized weakness. Edison’s blood work revealed a low WBC count and high liver values. The ingestion of toxic plants, mushrooms and/or weeds can cause sudden neurologic generalized weakness and liver value elevations. Last year at almost the exact same time in the summer, Edison presented very weak and unable to walk. Edison was out for a walk on a very hot day when he collapsed, and so we suspected heat stroke. IV fluids and supportive treatment saved him then as well. Pigs love to eat anything they can, and all farms usually have lots of different plants, grasses, mushrooms, and weeds that if eaten can cause neurological symptoms ranging from weakness to coma and even death. There are so many toxic plants out there, they cannot all be identified without the help of an expert. Edison is the smartest, most social pig around. He goes for daily walks on and off leash and can even do tricks like spinning to the right or left, etc. I believe that this time of year is when there must be some toxic plants that Edison must be getting into when he is out on his walks and given some free time out of his safe pen. The great news is that we were able to save Edison and he was able to go home with Bob! Our jobs as veterinarians and pet owners is to not just treat animals when they are sick, but to try and determine why they were sick so that we can hopefully proactively prevent them from future sickness and harm. Our patients cannot advocate for themselves, so we must advocate for them as best we can. We love Edison and made a visit out to Triple C Ranch on August 22nd. Edison is still doing great! 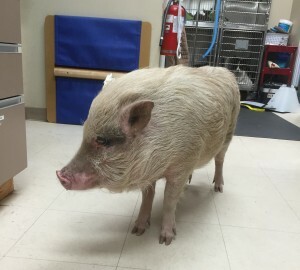 This entry was posted in General Pets, Veterinary Medicine, Veterinary Services and tagged Potbellied Pigs, Veterinary Medicine, Veterinary Services. Bookmark the permalink.